If you have a lawn, fertilize only in spring and fall. When you do fertilize, be sure to use slow-release nitrogen. And skip the phosphorous — Florida’s soil already has plenty. To kick the lawn habit, start small. Replace a corner of your lawn with a bed of shrubs, small trees and groundcovers. Or plant that butterfly garden you always wanted. Dig up the grass, or cover it with newspapers or plastic sheeting for a few weeks and then remove it. Turn over the soil a bit, plant your new plants, and cover them with about 3 inches of mulch. Water and weed regularly until the plants get a toehold in their new home. You can install some edging to define the new bed and keep that troublesome turf from creeping in. Then grow. Expand your landscape beds over time, and before you know it you’ll be devoting your weekends to relaxing instead of mowing, weeding, and edging. Add interest to your yard with meandering pathways that define your landscape beds and reduce maintenance time. Pathways can be created from shell, gravel, flagstones or mulch. Add a seating area or water feature, such as a pond or bird bath. You can create themed gardens — with butterfly plants in one bed, and maybe a scent garden in another with tea olives, gardenias and jasmine. Keep what you need. Pets and kids need a place to play. Respect their turf. Look for unused portions of your lawn to convert to landscape beds. 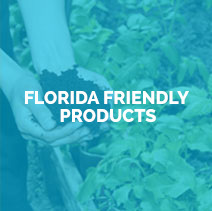 Florida-friendly plants need little care if you put them in the right spot. Sunny? Soggy? Shady? These Florida-friendly plants just need the right home. Sunny and dry. Hibiscus will produce beautiful flowers with little-to-no care. Sun/mixed shade and dry. Muhly grass is a low-key beauty that turns bright pink in the fall. Soggy spots. Florida canna likes to get its feet wet and has beautiful yellow, orange or red blooms. Shade. Cast-iron plant has deep green leaves, needs very little water, and grows in a variety of soils. Anywhere. Beach sunflower is a low-maintenance ground cover that never stops blooming. It tolerates poor soil, needs little water, and never needs fertilizer. Sure signs. Before watering your plants, look for signs of wilt or if leaves curl. Your lawn needs water when the grass blades fold in, or you can see your footprints when you walk on it. Get some sense. Place an inexpensive rain gauge in an open area so you can tell you how much rain your yard received, then supplement only if needed. Installing a moisture sensor will also help you know what’s happening at the root level where moisture is most important. Supervise your sprinklers. If you have an in-ground irrigation system, make sure none of your sprinkler heads are broken. Check on the sprinklers to make sure you’re not accidentally watering the sidewalk or driveway. Keep water restrictions in mind when you set your timer and irrigate early in the morning so the water doesn’t evaporate in the heat of the day. Install a rain sensor if your system doesn’t have one already. Make sure the sensor is pointed up so it can detect when it has rained and prevent your system from coming on. Indulge. When you do water, give your landscape a good, long drink (one-half to three-quarters inch per application). Your plant and grass roots will grow deeper and stronger than they would if you used less water more frequently. Healthier plants with deep roots need far less water and are much more resistant to disease and pests. Why dump toxins all over your little piece of paradise? Protect good guys like lady bugs, and give bad bugs the boot by hand-plucking or using non-toxic horticultural sprays. Know thy enemy. The No. 1 rule for pest control is to know what’s infiltrating your territory before calling in the chemical troops. Call your county extension office if you need help. Learn to recognize the good guys. Ladybugs love aphids, mites, mealy bugs and leafhoppers. Spiders are your friends — widows and recluse spiders are the only venomous varieties in Florida. Less is often best. Many insect pests, such as eastern lubber caterpillars or tomato hornworms, can be easily removed by hand and squashed or drowned in soapy water. Go natural. A variety of non-toxic horticultural soaps and sprays can help to keep harmful plant insects under control. Neem oil and a naturally occurring bacteria called Bacillus thurengienis (BT for short) are also effective organic pesticides.